There’s something about virtual pool that I can help but play. No matter how many games come out based on the sport, I want to try them all. None of them stayed in my rotation like Hustle Kings. When it released on PlayStation 4 last year I was hooked immediately. The game has made the jump over to PlayStation VR with all the expected upgrades, good and bad. 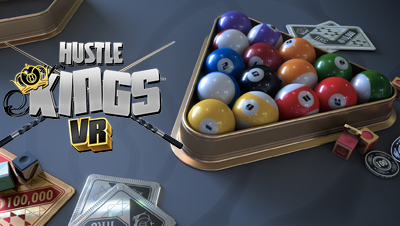 Developed by VooFoo Studios and out now for PlayStation VR, Hustle Kings VR is pretty much the exact same game that released on PlayStation 4. What’s new here is the fact that you can look around the table with your head as if you are standing right there at the table and a new control scheme. The control scheme allows you to use the two PlayStation Move controllers. This offers both the most authentic control scheme for pool and the most inaccurate and frustrating. Hustle King’s controls are quite intuitive, much more than the Move controllers can calculate. This will mean that you will miss more shots than with other control schemes. Using the move controllers this way will be fun for a short while on a novelty basis but when it comes to trying to win, you will move away from them pretty quickly. This may be the title you pull out and play with others that don’t normally play games. It’s more than an experience offered by the device and there’s nothing you really have to explain: its pool! It’s one of the only titles that can really be played in conversation with someone. However, there’s still no easy way to pass the VR headset to one another for taking turns. Doing this can cause some calibration problems as it was never really intended to be passed around like a controller. This is possibly the most passive game to release on VR which means you or only ever really the camera, moving closer and around the table. It’s relaxing with the headset on and thus I encountered literally no VR sickness whatsoever. I did want to walk over to the bar and order a drink. The game did not allow this unfortunately. Unlike every other game that previously existed on PlayStation 4 and has made the jump to PlayStation VR, Hustle Kings includes no new content whatsoever. While this is disappointing, there’s not much that could be done without feeling tacked on or a novelty that will be quickly forgotten. The core game itself is good enough and just being there in those locations was enough for me to enjoy the game. In terms of exclusive content though, it’s just the fun of getting different angles when lining up shots which, surprisingly, was enough for me to enjoy it.